The Company of Figaro! (90210). Photo by Ken Howard. 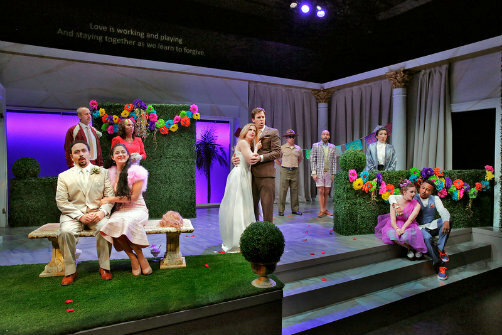 BOTTOM LINE: Mozart’s 1786 opera goes 21st century in this vibrant English and Spanglish adaptation set in Beverly Hills that tackles such hot button topics as illegal immigration and racism alongside songs about sexting and odes to breasts. For those looking for a little refresher course, Mozart, collaborating with librettist Lorenzo Da Ponte, composed the opera buffa (comic opera) The Marriage of Figaro in the last decade of his life. It was crafted to challenge the thinking of the day on matters such as class and power and as a result, was quite scandalous. In the original, the story revolved around an ardent Spanish count and two of his employees as he tried to break up the young lovers. As it gets closer to the wedding, Conti threatens the nuptials by holding Susana’s immigration status over her head unless she gives in to his advances. She knows, courtesy of her smarmy English tutor Basel (Michael Kuhn) that “Good girls they get Green Cards. Girls who don’t obey their bosses get deported.” Susana is in an even more perilous position because she’s in debt to Soon-Yi Nam (Sahoko Sato Timpone), a menacing Korean factory owner who got her into the U.S. Nam and her Armenian muscle Babayan (Ethan Herschenfeld) are leaning hard on Susana and Figaro to square things. Susana must figure out how to resolve their troubles while making sure that Figaro doesn’t go off half-cocked and do something that could get him arrested and deported. In between making passes, Conti must deal with his wife, petulant Goth daughter Barbara (Emma Grimsley), and aspiring would-be teen rapper Li’l B-Man (Dwayne A. Washington), whom Conti believes is carrying on with his wife but is actually pursuing his daughter. Before a wedding can happen there are hijinks, mistaken identities, accusations, reunions and renewed love. The multi-ethnic cast of fourteen are standout singers, with countless opera credits between them. They bring passion and depth to the lyrics, whether they’re singing about politics, infidelity, hip hop, vengeance or forgiveness. Among the gifted performers, Pérez and Alicea are lovely and adroitly move between fast-paced lyrics, comedy, and distress. Suarez-Groen is poignant and witty in her portrayal of the mistreated, Botoxed wife wondering what happened to the husband she knew twenty years before. Scott has the most difficult role as the bad guy who is at turns charming, wounded, and vindictive, which he does without making Conti completely unlikable or a buffoon. There’s also comic relief from Basel the opportunistic tutor and Atzuko (David Castillo), who memorably plays the gardener with pitch-perfect stoner hilarity. Vid Guerrerio has done a masterful job not only of making an 18th-century opera relevant for modern audiences, but also of hitting a lot of marks during this election season, with its many Donald Trump headlines. Guerrerio also skillfully weaves between English and Spanish lyrics (there’s a screen above the stage that projects the translations). But some of the plot threads are underdeveloped and a few of the characters get a rushed treatment, even in a two-plus hours production. Conti goes from being lecherous and obnoxious to villainous and entitled, siding with Nam and Babyan and singing about immigrants needing to get to the “back of the line,” which doesn’t seem entirely believable. Washington has a beautiful solo in the second half as B Man tries to woo Barbara, but some of his story drags and their romance is less compelling. Those issues aside, Crespo is adept at keeping the frenzied antics going at a lively clip without slipping into zaniness or growing tiresome. Steven C. Kemp’s set is fairly spare but there are some colourful touches with the window screens and in the vivid palette of the wedding scene. Lux Haac has a busy job outfitting for more than a dozen people, but Suarez-Groen gets the greatest number of costume changes and makes the most of her well-appointed outfits. Finally, what a treat to have a live orchestra on stage, expertly overseen by musical director Raphael Fusco. Don’t be put off if you’re a first-time opera-goer or if you think opera is too elitist. The show’s timely themes and messages prove it’s possible to transcend the ugliness of the current political climate with entertainment that delivers trenchant commentary with an abundance of showmanship. ¡Figaro! (90210) features W.A. Mozart’s original score with a new English (and Spanglish) libretto by Vid Guerrerio and directed by Melissa Crespo. Music Direction by Raphael Fusco. Scenic Design by Steven C. Kemp. Costume Design by Lux Haac. Lighting Design by Gina Scheer.